A tour from Yogyakarta to Bromo: Is It Possible? A Jogja Bromo tour is a popular choice for any tourist who wants to travel through Java. Well, it’s actually easy to understand why. This is because Bromo National Park offers that popular wonderful views that every tourist loves to hunt. If you are planning to visit Yogyakarta and want to take a tour to Bromo, the following information will be worth checking for! Generally, Yogyakarta and Bromo is not close to each other since they are located in different region in Java. However, it’s not difficult to reach the location since there have been so many options to make it possible. There are actually a few possible ways to get to Bromo from Yogyakarta. Here some possible ways that you can consider. First, you can take a local flight from Yogyakarta to Surabaya (a city close to Mount Bromo). The flight will only take about one hour and five minutes. There are three possible airlines including Wings Air, Sriwijaya Air and Garuda Indonesia. 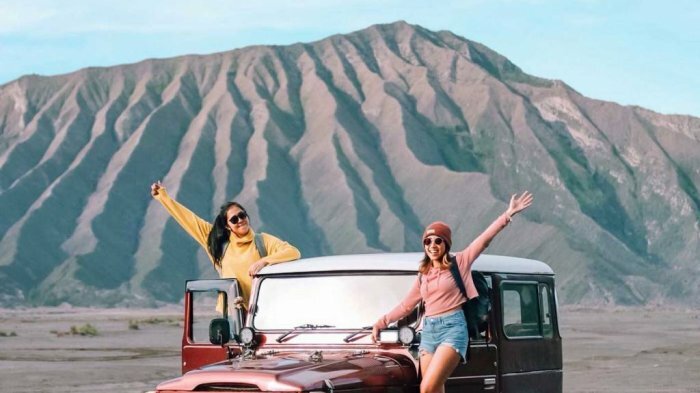 Since the airport is still away from the Mount Bromo, you may need to arrange for a car rental that can pick you up from the airport. If you prefer land transportation, taking a train from Yogyakarta to Bromo will be a good choice. For this option, you can take a train to Malang, Surabaya or Probolinggo as the destination. The journey will take about four to five hours by train. For your information, Probolinggo is considered as the nearest station to Mount Bromo. It can be one of the most comfortable options especially if you want to go to a Bromo nearest hotel directly. Then, you can also consider a road trip from Yogyakarta to Bromo. You can expect for an interesting and spectacular countryside view by taking a car. The Tawangmangu area is one of the highlights along the trip. But, it takes around 10 hours to reach Bromo from Yogyakarta by car. Most tourists are likely to stay in Malang before they continue the journey to Bromo. If you consider taking a trip by car, Yogyakarta to Malang route is the most recommended. For the easiest way to have a tour from Yogyakarta to Bromo, joining a sharing tour to Bromo from Yogyakarta is a good idea. There are a lot of tour providers that offer such package. It will be a lot easier since you don’t need to have much pain on arranging the tour. Then, are you ready to take an amazing adventure to Bromo from Yogyakarta? If you are ready for such adventure, you can simply visit www.jogjabromotour.com now and find the best package for Jogja Bromo Tour. There are various package options available there, so you can get the right one for your needs. So, what are you waiting for? Book your tour now and have fun later on!